Where is this year going?! For me, it seems as though it is travelling at supersonic speed and scarily, the end of the Spring term means that Bea also only has one term left of her first year of school. WOW! SO – we are still putting up with some pretty grim weather here in the UK, its cold, the snow is only just cleared BUT surely it will all change soon and as the kids break up from school tomorrow, we have started to talk about what we will do with the next three weeks of lovely / no school / no lunches to pack / no school run, plain and simple FUN! 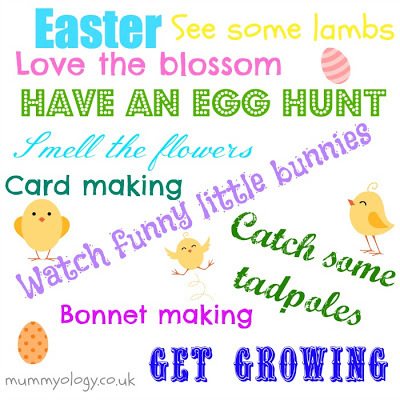 Here is what we have come up with so far as a mums Easter Holiday Survival list / kids bucket list! 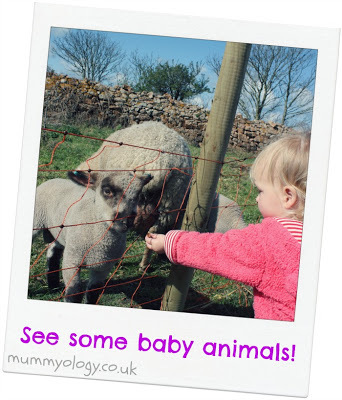 See some lambs / chicks – do you have a petting farm near you or a friendly farm to visit? We have a great place here in Jersey called Warren Farm. Its just a small holding that has opened its doors to visitors to look around and for kids to see the animals. The girls just LOVED being able to see the baby piglets, sheep and chicks there last spring, we can’t wait to get our wellies on and get back there. 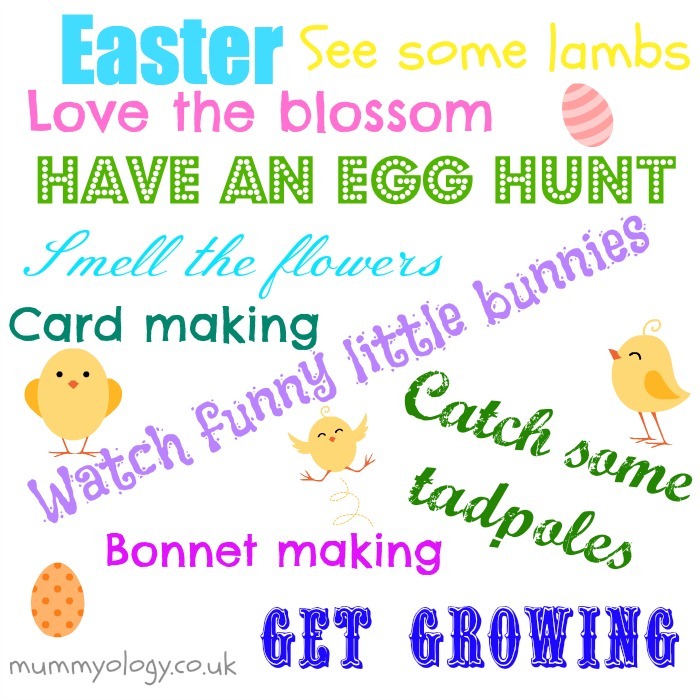 Buy lots of lovely Eggs for Easter breakfast – We have a wonderful family brunch on Easter Sunday and this involves a lot of eggs! Our favourite local eggs come from chickens which roam about their hi-tech coops at a nearby farm Free Range and friendly eggs are simply unbeatable – you never know, you might be lucky and get a double yolker! Paint some / go out and spot some blossom – Beas teacher is retiring soon so us lucky ‘last parents’ of the kids in her last year of teaching are kind of getting a ‘best of’ selection of her favourite crafts / books / lessons etc. While they have been studying the signs of spring, she has taught all the kids about the plant life cycle and how trees blossom. They have made the most beautiful paintings that are all up around the classroom and making it look so lovely of blossom trees with the kids fingerprints making the flowers. The kids have painted their own trees and flowers for the picture, if you want a quicker and still absolutely beautiful version, check out this lovely printable from Learn Create Love. 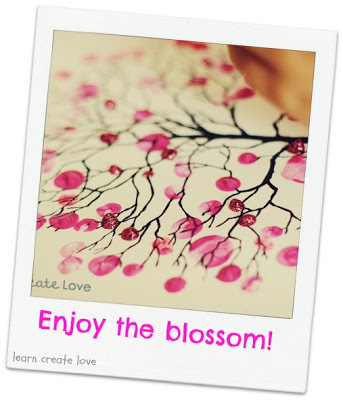 I also made Martha Stewarts lovely blossom branches with Freya – very easy and lovely to look at. Go on a Tadpole hunt – If you want your kids to learn about the miracle of spring and new life, a really amazing fun thing to do is to take your kids on a tadpole hunt. 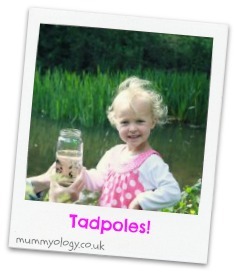 Obviously, you need to be aware of your kids safety around water and also that you aren’t trespassing but its loads of fun and even my super girly princess Bea was fascinated once we had our little jam jar full of wriggling tadpoles! When we head out this time with our big clean jam jars and fishing nets, I think I am also going to take a laminate picture of frogs growing from tadpoles into frogs to help Bea fully understand what it is she has caught! Plant potatoes – We live in Jersey in the Channel Islands, home to the Jersey Royal Potato, a gorgeous salad potato that grows well on our sunny sloping fields and turns the whole island into a bustling farming frenzy at this time of year to get the seed potatoes into the soil as early as possible. We have a tiny garden but always plant our own little crop too. For me it helps my kids understand why we spend our life following enormous tractors and, oh yes, they also get a great lesson in where food comes from! Being able to harvest some spuds for their own dinner in the summer time from our little veg patch is magic. For good planting instructions, check out this wikihow link. 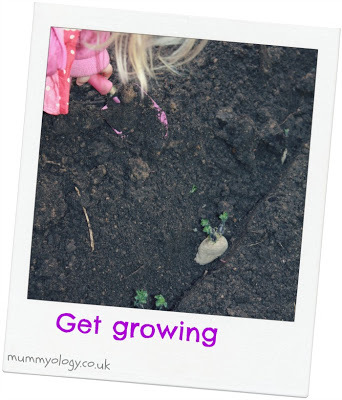 Find worms – While you are digging your potato patch, have a worm dig! We had an hilarious hour of finding, touching, holding and measuring worms! Hey, I’m not ashamed of taking a measuring tape to a wiggle worm, its education! It was very funny to see the difference between fearless and younger Freya and Bea who treated the whole thing like an episode of I’m a Celebrity get me out of here! It was worth it for the squeals! Pick some / buy some daffodils or other spring flowers – its such a pretty time of year. Get out and find yourself some lovely spring flowers for your home. 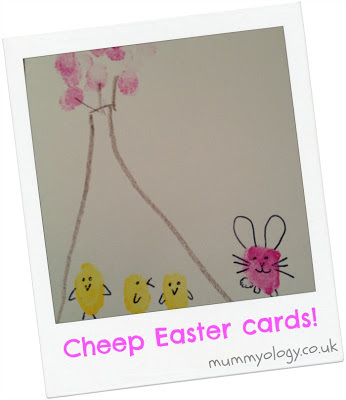 Make your friends an easy easter card – got an hour or so? Why not make some of the family or some friends an Easter card. We made Beas teachers some lovely ones making fingerprint Chicks and bunnies that I had seen on Sarahndipities blog They were so easy and really cute. Top tip for finger printing too – put the paint onto a sponge not a plate for your kids to dip their fingers into. Having it on a sponge makes sure they don’t overload their fingers! Make your new chicks some coops – If your house becomes overrun with little easter chicks this year, make some of them a new home. As you saw in my post last week, they are too easy and too cute not to try! Watch ‘Funny Little Bunnies’ – If you are looking for a little family tradition to start, then make it this! 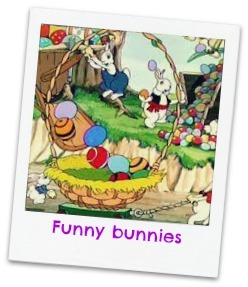 A few years ago, my dad stumbled upon this little Easter bunny animation and the kids simply adore it. Check it out here, its Disney gold. Easter baking – Kids got too much chocolate this Easter? My theory is that if you use it up with them then they won’t mind! SO get baking! We love Chocolate banana bread and it really doesn’t matter what choc you use or these lovely oldschool Chocolate cornflake cakes are a winner every time. Make an Easter bonnet – Beas school is having a ‘recycled’ Easter bonnet parade, we have had great fun decorating one of my mums old hats with egg boxes, cut out Easter pictures, some cleaned out egg shells holding chocolate eggs and some old silk flowers – she definitely will stand out even if she doesn’t win! Its been quite a fun project to dip in and out of and I have seen quite a few cheap straw hats in the shops, why don’t you find a local parade to join in with? Get the Easter Bunny to visit! Do your kids believe in the Easter Bunny? It isn’t something that ever featured with me when I was little – yes, we had Easter and Eggs appeared but I just knew it was my parents! My niece however had a visit from the EB last year at nursery and ever since we have all been sold into the story! 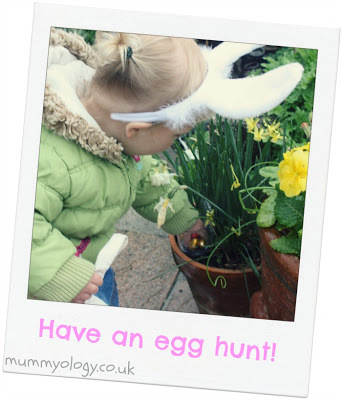 The mummies really enjoyed creating their egg hunt last year and the girls enjoyed filling their baskets! This year, my sister has gone the eggstra step and hired a costume for her husband to make an appearance in! Enjoy your family time – For me, Easter above all is a lovely holiday because it isn’t gift centred like Christmas. Yes it has certainly become Chocolate obsessed but over and above all this for us, its about our big family and extended family brunch that my sister hosts each year. Its a bright, cheery, non alcoholic, deliciously scented get together than has been known to last until late afternoon. A fabulous way to enjoy a day – try it, you might like it! If not one big family brunch and if you aren’t using the break as an excuse to jet off on holiday, simply enjoy some time out from the fast pace of life and soak up some family time together. Fly a kite – it might cost more than tuppence for the paper and string nowadays but one of my big craft wants for my little Mary Poppins fans this Easter holiday is going to be to try to make a kite… watch this space! Make and eat a Simnel cake – or visit someone who has! Yes! Don’t forget that Easter didn’t start out as a chocolate inspired event… A Simnel Cake is made to signify the end of lent and is a real Easter tradition in my family and thankfully my mother is still making our families cake, I haven’t attempted it yet! I have a feeling that it might be quite a British thing, am I right? If so, have a try at making it and let me know what you think – I think its delicious! Most important of all – have fun! Even when your kids are getting under your feet and you are only mid way through the holiday, take a deep breath and laugh at yourself – they are only young once! Free May Kids’ Activities Calendar! How many women are you? Make a simple origami tulip! Great ideas! I actually woke up wondering what to do with the kids today – you’ve inspired us to go on a field trip to the petting zoo in Montreal! Thanks. So many great ideas? My favorite is the worm dig. Well technically it’s not “my” favorite, but I know my little guy would absolutely have a blast doing it. He loves anything that involves dirt!